For the Changde meteorite of 1977, see meteorite falls. Changde (Chinese: 常德; pinyin: Chángdé [ʈʂʰǎŋ.tɤ̌]) is a prefecture-level city in the northwest of Hunan province, People's Republic of China, with a population of 5,717,218 as of the 2010 census, of which 1,232,182 reside in the built-up area (metro) made of 2 urban districts of Dingcheng and Wuling. In addition to the urban districts, Changde also administers the county-level city of Jinshi and six counties. Changde is adjacent to Dongting Lake to the east, the city of Yiyang to the south, Wuling and Xuefeng Mountains to the west, and Hubei province to the north. In the 1943 Battle of Changde, the Kuomintang's National Revolutionary Army attempted to stop the invading Imperial Japanese Army from completing their invasion of Sichuan. Frustrated, the Japanese side employed chemical weapons to clear their way. 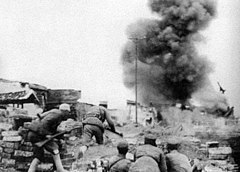 During the Khabarovsk War Crime Trials, proof was presented of operations to contaminate the area with plague as early as 1941 and 1942. It has a monsoon-influenced, four-season humid subtropical climate (Köppen Cfa), with cool, damp winters, and hot, humid summers. Winter begins relatively dry but not sunny and becomes progressively damper and cloudier; spring brings frequent rain and the highest humidity levels of the year. Summer is comparatively sunny, while autumn is somewhat dry. The monthly 24-hour average temperatures ranges from 5.0 °C (41.0 °F) in January to 28.9 °C (84.0 °F) in July, while the annual mean is 17.37 °C (63.3 °F). The annual precipitation is about 1,366 mm (54 in). With monthly percent possible sunshine ranging from 22% in February and March to 53% in July, the city receives 1,602 hours of bright sunshine annually. Tobacco is the most important industry in Changde. Changde Cigarette Factory (CDCF), now a subsidiary of China Tobacco Hunan Industrial Co., Ltd., is one of six key cigarette companies in China and employs 8,300 workers in Changde as of 2013[update]. CDCF is by far Changde's largest industrial concern accounting for 4.22 billion (51.2%) of the city's 8.2 billion total industrial value added in 2012. Changde is also an administrative centre and a storage and shipping point for tung oil, grain, cotton, medicinal herbs, and wood. Manufactures include ceramics, machine tools, textiles, leather, and processed foods. Grain, oil, cotton, and other commodities are loaded into medium-sized ships and taken to Yueyang, Changsha, or Hankou (Wuhan, Hubei province) for onward shipment. Timber is also rafted there and floated across Lake Dongting to Yueyang, and thus to the Yangtze River. After 1949 the city developed some light industry, mostly based on such local products as wood, leather, and bristles. The Tujia people are native to Shimen county, having occupied parts of the area for over 2000 years. Other significant ethnic minority populations in Changde include the Hui, Uyghur, Miao and Zhuang peoples. Fengshu Hui and Uyghur Autonomous Township (枫树维吾尔族回族乡) in Taoyuan County is the largest Uyghur community outside of Xinjiang Uyghur Autonomous Region. Fengshu is one of four Hui and Uyghur Autonomous Townships in Changde. The other three are Qinglin (青林) also in Taoyuan county, Xujiaqiao (许家桥) in Dingcheng district, and Maojiatan (毛家滩) in Hanshou county. Changde has the largest Hui population in the province. Minority ethnicities represented 7.2% of the total population of Changde in 2010, 0.8% less than in 2000. By far the largest group of ethnic minority residents is the Tujia with 361,200 people or approximately 6.3% of the total population. The Tujia made up over half the population of Shimen county as of 2009[update]. As for the other major minority ethnic groups present in Changde, the Hui, Uyghur, Miao, and Zhuang peoples respectively comprise 0.5% (33,500 people), 0.08% (4,800 people), 0.08% (4,500 people), and 0.02% (1,300 people) of the total population of Changde. The current CPC Party Secretary of Changde is Zhou Derui and the current Mayor is Cao Lijun. Changde Taohuayuan Airport (CGD) was constructed in 1958 and links Changde with several other Chinese cities including Haikou, Beijing, Shanghai, Kunming, Shenzhen, Guangzhou, Nanjing, Tianjin, Liuzhou, Chongqing, and Wuhan. The airport is located approximately 12.2 kilometres (7.6 mi) south of the city. ^ 常德市2016年国民经济和社会发展统计公报. Changde Bureau of Statistics (常德市统计局). Retrieved 15 May 2017. ^ a b c "Introduction to Changde". Changde(China) Official Web Portal- Changde's International Window. Changde City Government. Retrieved 7 December 2013. ^ "Changde Poem Wall". China Daily. 2004-06-08. Retrieved 12 December 2013. ^ Charles Higham (1996). The Bronze Age of Southeast Asia. Cambridge University Press. p. 63. ISBN 0-521-56505-7. ^ "China's Hunan may be birthplace of cultivated rice". People's Daily. Xinhua News. November 24, 2011. ^ "Reinventing Waterscape Urbanism: Changde, China" (PDF). Hannover: Federal Institute for Geosciences and Natural Resources. 5 August 2008. Retrieved 11 December 2013. ^ "Mount Huping National Nature Reserve". Hunan Provincial People's Government. 2008-09-17. Retrieved 19 December 2013. ^ Yiyuan Qin; Philip Nyhus (April 2010). "South China Tiger Prey Habitat Suitability Assessment in Hupingshan - Houhe National Nature Reserve Complex, China" (PDF). Retrieved 17 December 2013. ^ "Tobacco Industry". Changde City Government. Retrieved 7 December 2013. ^ "Changde Cigarette Factory". Changde City Government. 2013-08-22. Retrieved 21 December 2013. ^ 常德卷烟厂 (in Chinese). Changde People's Government. 2013-07-23. Retrieved 21 December 2013. ^ Liu Yong (刘勇); Peng Yahui (彭雅惠) (2013-07-08). 常德：从"一烟独大"到"三足鼎立". Hunan Post. Retrieved 21 December 2013. ^ 湖南人口老龄化与公共管理创新研究 (in Chinese). Statistical Bureau of Hunan Province. 2012-11-02. Retrieved 15 December 2013. ^ "Ethnic Minorities". Changde City People's Government. 2010-07-05. Retrieved 15 December 2013. ^ a b 常德市少数民族概况 (in Chinese). 常德市民族宗教事务局. 2009-06-19. Retrieved 15 December 2013. ^ a b 常德市人口发展报告 (in Chinese). 常德市统计局. 2011-11-16. Retrieved 15 December 2013. ^ 李, 永明 (1989). 常德方言志 (in Chinese). 岳麓书社. p. 2. Retrieved 22 December 2013. ^ 郑, 庆君 (1999). 常德方言硏究 (in Chinese). 湖南敎育出版社. Retrieved 22 December 2013. ^ 常德日报传媒集团简介 (in Chinese). 常德市日报社. 2008-09-22. Retrieved 21 December 2013. ^ 常德市广播电视台所属媒体介绍 (in Chinese). 常德市广播电视台. 2008-11-25. Retrieved 21 December 2013. ^ Shih, Chih-yu (2002). "Ethnic Religion: The adaptation of Islam". Negotiating Ethnicity in China: Citizenship as a Response to the State. Routledge. p. 129. ISBN 0-415-28372-8. Retrieved 20 December 2013. ^ 常德特产·武陵擂茶 (in Chinese). 红网综合. 2007-08-28. Retrieved 20 December 2013. ^ 常德丝弦介绍 (in Chinese). 湖南省非物质文化遗产保护中心. 2008-12-19. Retrieved 18 December 2013. ^ 国务院关于公布第一批国家级 非物质文化遗产名录的通知 (in Chinese). Government of the People's Republic of China. 2006-05-20. Retrieved 18 December 2013. ^ Zhang Yi, ed. (2013-03-06). "Railway to bring Chongqing, Changsha closer". Chongqing News. Retrieved 17 December 2013. ^ a b "Changde to Usher in the Era of High-speed Rail". Changde City Government. 2013-09-14. Retrieved 17 December 2013. ^ "Changde BRT(Bus Rapid Transit) System". Changde City Government. 2013-07-30. Retrieved 8 December 2013. ^ "Changde BRT". Institute for Transportation & Development Policy. 2013-03-30. Retrieved 8 December 2013. ^ "Changde Public Bicycle Rental System". Changde City Government. 2013-07-31. Retrieved 8 December 2013. ^ "Hunan's First Public Bicycle Rental System Launched in Zhuzhou". Hunan Provincial People's Government. 2011-05-08. Retrieved 8 December 2013. ^ "Public Bike: Changde". Institute for Transportation and Development Policy. 2013-07-05. Retrieved 8 December 2013. ^ 天津—常德—柳州航线6月28日开通，每天一班 (in Chinese). Changde Taohuayuan Airport. 2013-07-01. Retrieved 8 December 2013. ^ "Taohuayuan Airport". Changde City Government. 2010-07-05. Retrieved 8 December 2013. ^ "Changde Port- Shanghai Port Direct Route Opens". Hunan Provincial People's Government. 2012-09-18. Retrieved 8 December 2013. ^ "Liuye lake Introduction". Changde Municipal People's Government. 2009-10-27. Retrieved 11 December 2013. ^ Kuhlman, Erika (2002). A to Z of Women in World History. Infobase Publishing. p. 362. ISBN 978-0-8160-4334-7. ^ Guo Jian; Yongyi Song; Yuan Zhou (2006). Historical Dictionary of the Chinese Cultural Revolution. Scarecrow Press inc. p. 125. ^ "Lin Boqu". CPC Encyclopedia. China Daily. Retrieved 7 December 2013. ^ "Liu Yuxi". Anchor Book of Chinese Poetry Web Companion. Whittier College. Archived from the original on 27 February 2013. Retrieved 7 December 2013. ^ Gao, James Zheng (2009). Historical Dictionary of Modern China. Scarecrow Press inc. p. 334. ISBN 978-0-8108-4930-3. ^ "Yuan Chunqing" 袁纯清. China Vitae. Retrieved 12 December 2013. ^ 香香的艺人档案 (in Chinese). Retrieved 19 December 2013. ^ 许榆婧 (in Chinese). Retrieved 12 December 2015. Wikimedia Commons has media related to Changde. Wikivoyage has a travel guide for Changde.